Tomei Complete Short Block - Pann Auto Performance - San Diego largest aftermarket automotive performance parts - What do you drive? From the combustion chamber to the cylinder, a piston works inside the core of the engine assembly where the energy of the explosion is converted into rotational movement. The piston suffers the most abuse out off all the components inside an engine, with standing such factors as the force from constant amounts of massive energy and severe fluctuation in temperatures. The connecting rods role is to transfer the compressed pressure that the piston receives to the crankshaft. When the connecting rods inertial weight and balance then plays a major factor in the smoothness of the engines rotation assembly and durability at high RPM. The weight factor it self will dramatically change the engines characteristics. Crankshaft is the parts that change vertical movement of a piston into rotational movement. It is suffered from explosion load and inertia power, and the load by bend vibration or torsion vibration. When applying fastener load to any type of bolt, it typically applies the most stress to the first three threads. Tome Powered head studs are designed to distribute this load throughout the entire engaged thread of the stud, for the maximum holding capability. When tuning engines for higher power output and high RPM the bearings are subjected to extreme load conditions. These harsh conditions require the bearings to be able to cope with excessive loads and stress conditions. The Tomei Competition Bearing series are designed for fatigue resistance, durability, effective lubrication and resistance to scoring. 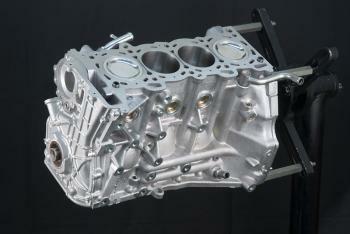 Designed for use on engines that will be outputting 1,000 HP and at over 10,000RPM. These advanced designed bearings are suitable for the serious professionals in mind whom need results. We also have 3 grades available on all engine applications. Serial Plate – A special Tomei Serial number is linked with the engine and the manual provided. Spec Card – Clearly specifies the main parts and specs for reference on your future rebuilds. Product Manual – Explanation book detailing the parts & build process to give you the inside view of the technical power of Tomei. Emblem – A Tomei emblem is included for displaying that your car is fitted with a Tomei short block.